Need a new phone but on a tight budget? 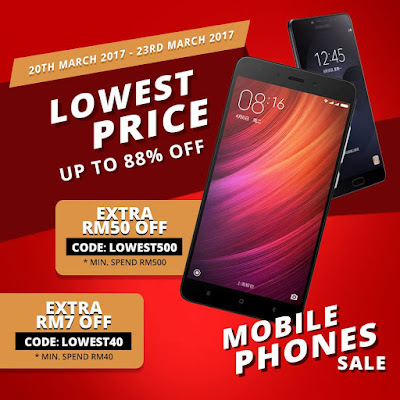 Fret not, get the Lowest Price Mobile Phones on Shopee at up to 88% off! Valid till 23 Mar 2017 (11.59am). Minimum spend of RM500 (LOWEST500) or RM40 (LOWEST40) required. Applicable to items in this collection only. Applicable to payments involving Shopee Guarantee (credit card, online banking &amp; bank transfers only). Harga Runtuh's Pro Tip: Don't be misled by the picture, both of these Shopee Malaysia promo codes are applicable to all product categories (for example Powerbanks & Batteries) and not just mobile phones only.